The Blackwell Companion to Paul presents a distinctive dual focus approach that encompasses both the historical Paul and the history of Paul's influence. In doing so, expert contributors successfully address the interests of students of early Christianity and those of Christian theology. Offers a complete overview of the life, writings and legacy of one of the key figures of Christianity. 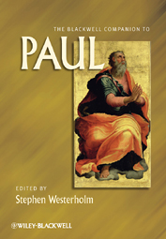 The essays compass the major themes of Paul's life and work, as well as his impact through the centuries on theology, Church teaching, social beliefs, art, literature, and contemporary intellectual thought Edited by one of the leading figures in the field of Pauline Studies.